I first saw it while flying into Lake View Oregon, looking to the East, I first thought it was another large thunder cloud. The Big Fire was already several hundred acres by sunset. Dispatch was ordering heavy air tankers as the fire started generating its own weather. Dozens of ground crews and dozers were en route before midnight. Helicopters fighting the fire included; Sky Cranes, S61’s, CH 46’s, Hueys, Short Rangers and of course 12Mike. The next morning Lakeview Airport was a bee hive of activity, 18 helicopters and 10 fixed wing are flying to and from the Big Fire. Soon a portable FFA tower was installed to insure some semblance to order in the traffic pattern. Fire Fighting activity on and near the fire required a higher level of management, and so a type one fire team was dispatched. 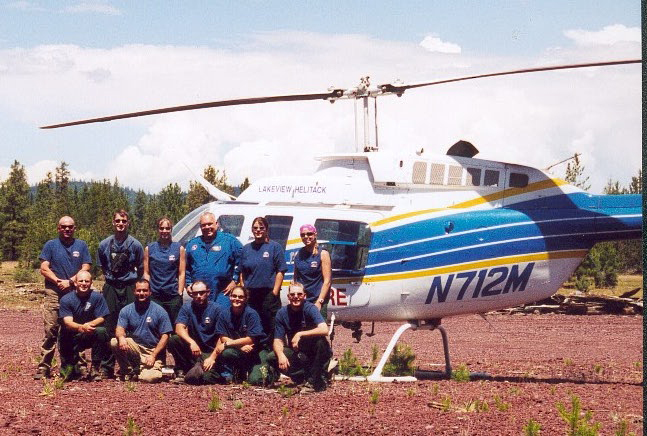 A fire team is used when the fire exceeds the local fire management capability to manage it. The Type one team arrived, on day two, and assumed control and responsibility of putting out the fire. A big fire requires a big Fire Camp, so let the fun begin as a complete city of fire fighters and support folks descend on Lakeview like locusts. Fire fighters are starting to arrive at the fire, but gusty winds and unpredictable fire behavior cause the most activity to be from the air. Air tankers descend through the smoke and rough air to drop red colored retardant on the flames. They are following lead planes, OV-10 Broncos and Beech Craft Barons. Above them are the Air Attack, the command and control supervisors flying in O-2’s, AK’s Cessna Skymasters (C-337’s), turbine Commanders and King Airs. At the lower altitudes are the helicopters. I feel a surge of adrenaline watching the air tankers drop knowing I’m next to fly in the fray. As soon as the air tankers leave for Klamath Falls to reload, the heavy helicopters try to stop the flames that have jumped the retardant line built by the tankers. Cranes and Baby Chinooks drop thousands of gallons on each pass. The fire has a mind of its own and is spitting out whirlwinds of flames spreading the fire so fast that the head of the fire jumps a state Hwy and the entire fire fighting force is now miles behind. The Incident Commander (commanding officer) needs a precise map of the fire so I fly the fire perimeter with the special GPS program. This program prints a map minutes after I land at the helibase off of a GPS. It takes me 45 minutes to fly the perimeter, visibility is now less than two miles and aviation activity is being curtailed. The second day dawns with over 1,500 fire fighters and support folks in the fire base camp. A sea of colorful tents have sprung up like mushrooms. Larger tents have enough room for staff meeting with 30 people in them. Five large satellite dishes for direct communication are used to order more fire fighters, equipment and keep the regional and national offices informed. A shower trailer is set up with plenty of hot water, soap and towels. Dinner that night rivals any of the better restaurants in town. Hot food is served up by mobile kitchens arriving from Utah. Big strong women dish out all the food you want and act like they’re real happy you have a good appetite. Got jock rash? Need supplies? Need to call home? Need to get paid? A medical station and complete services for the fire fighters are provided. Chain saws and generators have a way of walking off so the fire camp has its own police force. If the fire camp is such a good deal, you might ask “Why go out on the fire and get tired and dirty?” That’s what a lot of folks ask, and as a result there are more than a few Fire Camp Slugs. Fire Camp Slugs hang out and avoid as much work as possible. The third day dawns with a signal that the fire has grown in epic proportions. You know your fire is TRULY big, when the portable fire T-shirt company shows up. Normal fires don’t have their own T-shirts, only big fires have this honor. The Big Fire is more than 100,000 acres and growing, but then so is the fire camp. The fire camp has a team of Public Affairs Officers (PAO’s), who are now spreading the word that the fire has grown from one acre to over 100,000 acres. “All that smoke in town is from the fire,” the PAO’s explain, “fire can be good, that is why we’ve spent over two million dollars to fight it.” This would normally piss off many of the local folks, as they’re not overly fond of the government anyway, but the fire camp has added a buying team to their forces. Business has never been better in Lakeview Oregon. By the fifth day the fire has over 800 firefighters working on it. As I start lifting supplies via long line, I can see dozens of fire crews in yellow shirts working the fire lines of the Big Fire. I dodge in around other helicopters busy doing fire business. The scene reminds me of traffic of the future cities were everyone has access to a hover craft. The helitack crews remind me that my cargo net has fresh fruit and Gator Aid and not to drop it. I’m told by air attack to hold outside the Big Fire area until the heavy air tankers are through dropping. After waiting for several minutes I inform him I have fresh fruit swinging under my helicopter for the fire fighters and I’m immediately cleared right to the helispot. On the seventh day the Lord said, “enough of this fire stuff,” and the wind stopped blowing. The Big Fire was no more. Now you might think that the Big Fire is out because the Lord said so and stopped the wind from blowing, but gentle reader be so not deceived. The fire ain’t out until the Incident Commander so says, besides he has more fire crews on the way and there are still large amounts of Big Fire T-shirts unsold. Just because God says the fire is out doesn’t mean much, just how long do you think it takes to build a fire line around the fire? How long does it take to demobilize hundreds of folks, folks I might add who like being on the Big Fire? Do you really understand the concept of overtime? What about the fire camp slugs who like hanging in the fire camp?